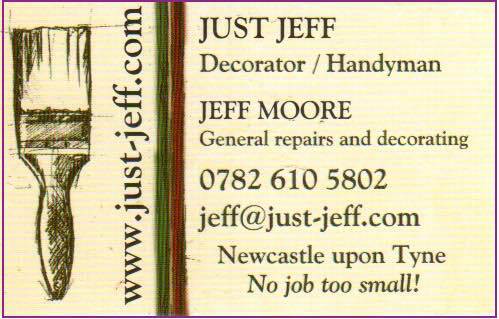 What about building, roofing, renovation, electrics . . .
No problem! I have a short-list of carefully selected, qualified tradesmen and women who take pride in their work, are trustworthy, reliable and offer good value for money. 3D visualisations and solid models for builders and developers, planning applications, extensions etc. 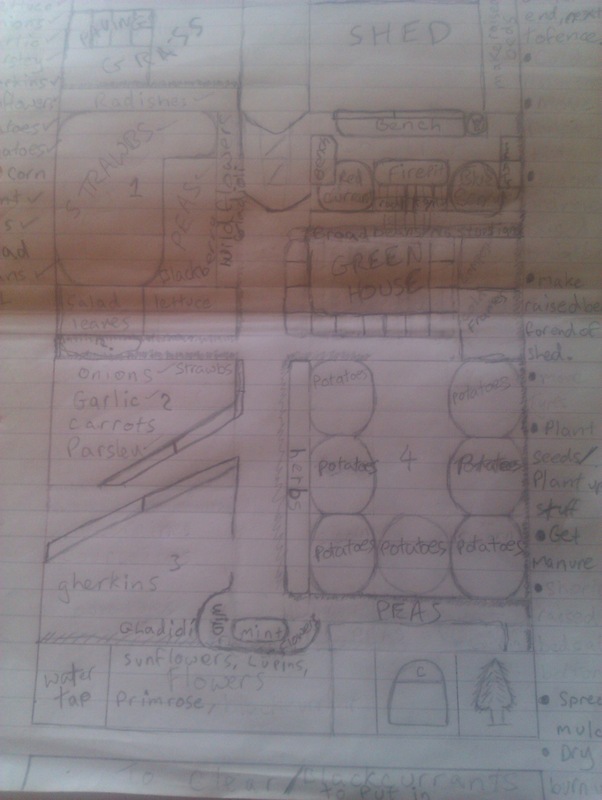 Allotment Planning – Physical Layout – Get some paper, a pencil . . . and a rubber! When you first get an allotment it might be overgrown and you need to clear it and start from scratch. As you are hacking through the brambles, you will be thinking about what to grow and how to rotate plantings to make best use of the plot. You will also be thinking about how to lay out your allotment. You could also do a fancy version with computer aided design (CAD) using free tools like Google Sketchup if you like that sort of thing. My allotment is very important to me. I feel like I am in the countryside and enjoy growing fruit, flowers and vegetables . . . and eating them! This was a relatively new door handle on a new door. The inside of the unit had broken and the door could be unlocked but could not be opened. If there had been a fire, the occupants could not have escaped through the back door. The family dog was very distressed not being able to get into the yard. For insurance purposes, the family car had to be parked in the yard overnight. The yard had a high wall and high gate. The gate was padlocked from the inside. To park the car in the yard securely, someone would have had to climb over the gate to unlock it then, after parking the car, lock the gate and climb back over in order to get out of the yard. They would have to climb back over in the morning to get the car out of the yard, lock the gate from the inside and then climb back out over the gate again! 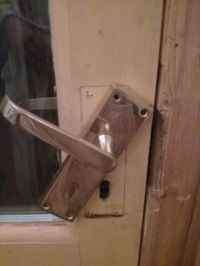 There was another problem with the original door furniture. The door lock was part of the fitting and the key hole was open. In the winter, the keyhole had to be stuffed with a rag to stop a severe draft blowing through. Remove the fixing plate on the inside of the door to access the inner parts in order to open the door and make a temporary repair so the door could be opened and latched easily. Source replacement fittings in order to replace the original fixing. Source suitable key hole covers (escutcheons) for the inside and outside of the door to stop drafts. Remove the original door furniture, fit new handle and escutcheons. Make good by filling old screw holes and repainting door. Pleased to meet you – my card! Rain or shine! No job too small! What about building, roofing, renovation, electrics . . . ? © Jeff Moore and Just-Jeff.com 2010-2013. Excerpts and links may be used, provided that full and clear credit is given to Jeff Moore and Just-Jeff.com with appropriate and specific direction to the original content. 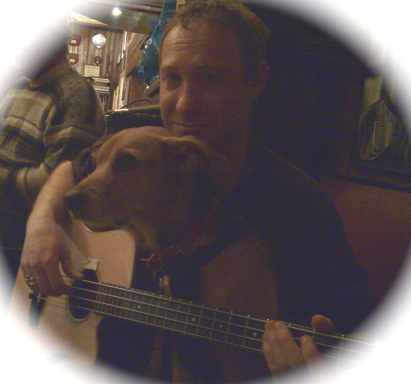 Please note that if you see adverts on this site, they have been placed there by Wordpress.com - not by me. I have no control over which adverts are placed.